The Multistrada 950 is another wonderful idea from the Ducati’s family. This motorcycle is very friendly and more affordable in India than many other popular bikes like the four-bike Triumph Tiger 800. The Ducati Multistrada 950 portrays a change in of direction to adventurer tourers. Since these group of riders where used to larger and heavier bikes than of recent. Hence the smaller and lighter Multistrada 950 makes it accessible and easy for them to venture. Even so it is less powerful making it easier for the less experienced bikers. As for the Multistrada 950 design, it looks identical to the Ducati Multistrada 1200. So the same beak-like nose, twin headlights, fairing and flyscreen are seen on the 1200. However the Multistrada 950 has a wheelbase which is longer than the 1200’s at 1,594 mm, also as opposed to the 1200’s 17-inch wheel the 950 uses a 19-inch unit. However, this bike feels more like a street bike than an adventurer tourer on the road. When on its saddle, its riding position gives you an upright position while your feet rest on the rearset footpegs offering a position in which you can ride hard in all situations even around corners or through traffic. The saddle has a fixed height of 840mm hence making adjustments possible so that the rider can put both of his/her feet down. Its 19-inch front wheel is very communicative and overall the Multistrada 950 dynamics and punchy motor together makes it a lot of fun to ride at a great speed. Also it has a well-sorted suspension which is adjustable but non-electronic and its Pirelli Scorpion Trail II tyres all enhance riding at great speed. These tyres offer plenty of grips wen riding especially on mountain roads. Its suspension is stable, but absorbs in bumps and potholes without unsettling the bike. As such a dash of dirt roads should not be a problem for it either. Nevertheless it is very impressive as a machine for riding to work daily and going out on long rides. As for the Multistrada 950 engine’s, it is a Hypermotard/Supersport’s 937cc liquid-cooled 90-degree twin. This engine is a simple unit without the 1200’s exotic technology. At low revs, the engine has a slight vibration these smoothens out past 3000rpm, which is where the engine offers its full strength, allowing you to speed up rapidly. With the Multistrada 950 you can hit 100kmph in just 4 seconds. The bike accelerates well past 150kmph coherently, and should not have any trouble moving over 120kmph all day, making it an ideal mile muncher. This slim delicious ride rapidly moves in traffic. This is due to the engine’s punchy, quick to rev nature. Its gear ratios are well chosen and its shifts are light and precise. 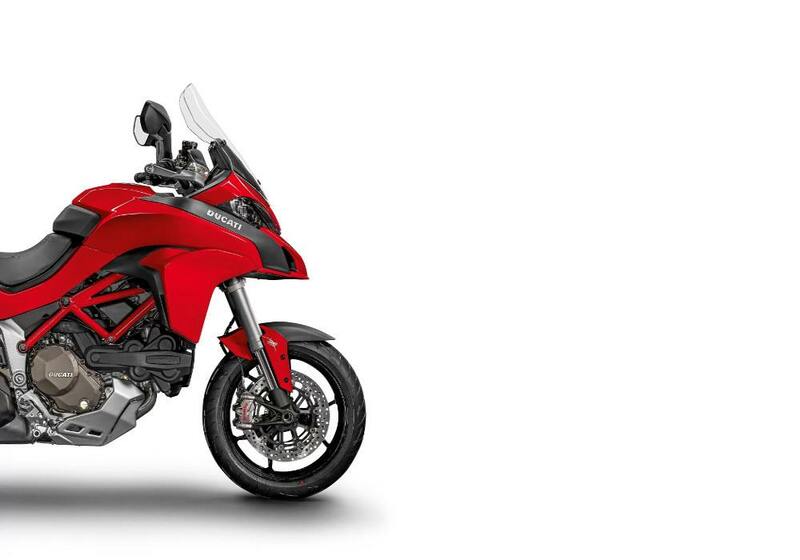 The Multistrada 950 is not as sophisticated as its predecessor the Multistrada 1200. But this does not necessarily make it a bad bike. It has all the basics in place and enough electronics to keep you far away from getting into serious trouble. The 950 has an electronic setup which has the Sport, Touring, modes offer full power of 113PS with different throttle responses, while the Urban and Enduro modes reduce the output to 75PS. Each of these modes has its own presets for how much ABS or DTC are allowed to intervene. But as for its switchgear, it is different and it’s simpler than the 1200’s. The switches are good as well. It has switchable eight-level traction control and three-mode ABS but misses out on wheel control. The bike also has a Ducati Safety Pack (DSP). As it was designed, the Multistrada 950 remains true and outstanding in its role, which is being a multipurpose adventurer tourer with its entire structure which is small, light, easily accessible and equally capable. It also has some impressive features on which one can really get a lot of fun just like the TFT dashboard, cornering lights and even cruise control. After all said what to expect from the Ducati Multistrada 950 is nothing less than a great riding experience which is extremely rewarding and which is not often obtained from its predecessor Multistrada 1200. In India this marvel unlike (Panigale 959) cost about Rs 3 Lakhs less than the 1200 making it profitable without compromising the fun.The ex showroom price is INR 1290000 Lakhs.